Qualelibet was the official newsletter of the ISHBS. It is no longer being Published. Past issues are available below in PDF format. So the title means “whatever is pleasing to you,” with the idea that the newsletter will be pleasing to the reader and can contain whatever information the readers wish and find helpful. 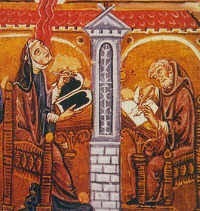 It is ultimately a variation on a form of academic dispute popular in 13th- and 14th-century universities called the “Quodlibetal Question” (Quaestio quodlibet), in which students would pose “whatever question they pleased” to their masters.